Even as someone who uses herbs every day, I had been resisting trying to manage my (somewhat) frequent stress headaches with herbs. 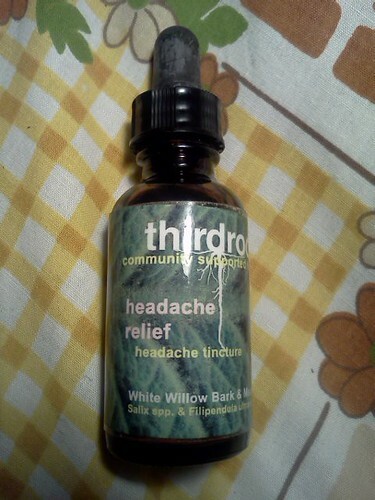 Until I found the "Headache Blend" by Third Root Community Health Center. I usually take ibuprofen or drink water. Recently though, I've been reading about how damaging over the counter painkillers can be for your liver and other organs, so decided to give the herbs White Willow and Meadowsweet a try. And can you believe it, my headache went away. Regardless of the cause of the headache - it could have been many things - I felt better and more equipped to go about my day. Meadowsweet and White Willow contain salicylic acid which is a blood thinner. Aspirin is a synthetic version of salicylic acid. I'm excited to work on modifying my life so that stress headaches don't happen anymore - but until then, I'll be using herbs instead of synthetic drugs. Thanks for visiting the first incarnation of my site! I'm excited to be able to offer sliding-scale massage for my community in New York City and the Hudson Valley. Take advantage of my opening by signing up for the newsletter and getting a special LOW sliding-scale rate for massage or herbal consult. As I'm a new practitioner, and I haven't worked on all my community yet, I want to support you and your work through massage and herbal medicine. I look forward to helping to support your health and your body!